Did you just buy the new Apple Watch Series 3? Are you looking for some cool looking accessories to pair your Apple Watch with? 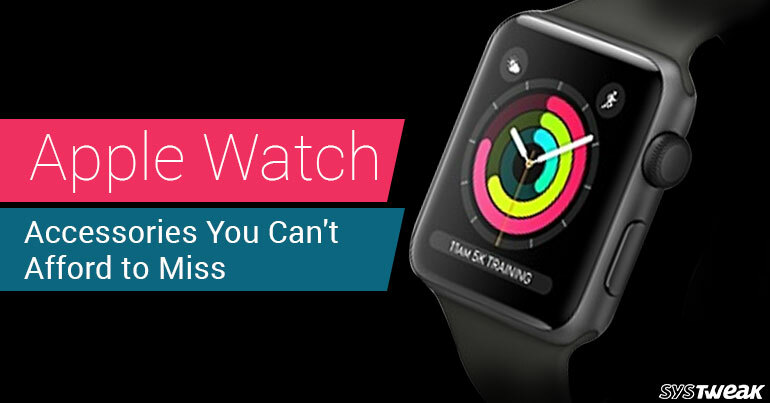 Like any other cool gadget that is worth getting some extra touch up, Apple Watch Series too is one nifty awesome looking gadget that you can pair with a number of cool accessories. Though Apple Watches are good when battery life is in question, there may be instances when you are out for some important work and your Apple Watch suddenly starts to show low battery. An easy breezy way to have your apple watch charged, Native Union Marble Dock is one of the best options you can opt for, while going for wireless chargers. It comes with an innovative design eliminating the sight of any wires. It has a square base that eliminates the magnetic charging pad and hence no wires are visible. Not just this, it comes with a top-notch design where the square base is made up of marble stones and comes in two color variants i.e. black and white. The same is available on nativunion.com for 129.99 USD. Apple Watch comes with an extremely cool glass screen. But as ritzy the screen is, the more necessary it becomes to keep it protected from any kind of wear and tear without cutting down the overall beauty. Ultimate Shield Screen Protector is the perfect solution to this. A screen protector that is just 0.2 mm in thickness is so sleek that it is barely noticeable. You can purchase this glass screen from ultimate shield for £4.99. What’s better than designing a strap for your Apple Watch yourself? Well! Casetify lets you do that! With Casetify, you can now have customized Apple Watch straps as per your liking. Choose pictures from Facebook, Instagram, or make one on your own, using Casetify’s mobile app or website. Not only this, it allows varied layouts for you to choose from. While ordering any strap from Casetify, user needs to mention whether they have a 38mm or a 42mm Apple Watch. The Apple Watch straps are made of polycarbonate silicone, and are available for price range starting from about 50 USD. Such an expensive watch needs to be taken care of, against any kind of damage! And what’s better than charging it at the same time while keeping it safe? WatchKeeper, is the perfect answer to all your worries. WatchKeeper container is a black or tan colored case where both the MafSafe connector and the charging cable easily fit below the watch when stored. This gives it a clean yet stylish look. WatchKeeper comes for 59.95 USD and can be purchased from studioproper.com. This is again a very attractive kit to keep your Apple Watch secure. Made up of “full grain American steer leather” with a Lenin interior, this kit comes with a watch holder, a charger and an extra band. Not only the kit looks amazing, it also comes with a 25-year warranty that is way too long for a warranty period. Roll Up Leather Case is provided by Pad & Quail and you can purchase it for 49.95 USD. So, if you are an Apple Watch Owner and want to add more to it’s beauty and security, this article is a must read. Look out for easiest ways to have your Apple Watch look much beautiful and elegant.